A massive crowd marched Thursday night to honor Josiah Pinner, the 15-year-old killed by an undercover deputy while crossing North Florida Ave.
HILLSBOROUGH COUNTY, Fla. — A massive crowd marched Thursday night to honor Josiah Pinner, the 15-year-old killed by an undercover deputy while crossing North Florida Ave. The crowd demanded justice in the investigation in a march that started at the spot Pinner was killed. The crowd marched more than two miles. About 70 Hillsborough County deputies were out with the protesters, helping provide traffic control and lighting along the march. “I had to come here and show that I actually care for him, I had to come here and show him I actually care for him as a friend,” Jose Rodriguez, another friend said. Some people question the deputy's speed and if his headlights were on, and the sheriff's office promises transparency. “Neither the investigative process nor the investigative results will change simply because a deputy sheriff was involved in this crash,” Col. Kyle Robinson of HCSO said. 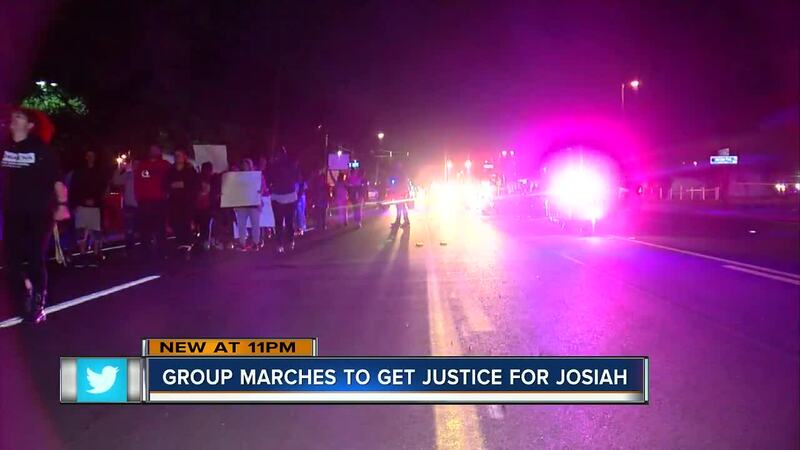 The march ended at a sheriff's office substation, where protesters vowed to keep Josiah's memory alive. “He’s feeling well-loved and supported and he knows that God is going to do justice,” protester Patricia Cuero said. The undercover deputy involved in the crash is not currently working, and chose to take some time off and step away from the job as the investigation continues.